Forming a venture capital fund is akin to creating, running and financing a startup, but with a higher degree of difficulty as a result of the overlay of several state and federal laws. Additionally, a number of legal disciplines, such as securities, employment, tax and corporate laws, that are implicated in the formation of the fund complicate matters more. This article provides a primer on these topics, which will hopefully lead to a beneficial discussion with legal counsel prior to the formation of your fund. Most venture capital funds are structured as limited partnerships, with the general partner serving as the fund manager (which itself is typically organized as a limited liability company) and acting as the investment adviser to the portfolio companies of the fund (which are usually incorporated as C-corporations). The general partner is an entity through which the fund managers make management, disposition and other decisions related to the fund’s investments and business affairs, and the limited partners are passive investors, such as pension funds, foundations, insurance companies and high net worth individuals. Alternatively, venture capital funds can be organized as limited liability companies and managed by a separate entity, which is usually another limited liability company. In either fund structure, the funds must be organized under state law (Delaware is a common jurisdiction of choice), and are usually governed by legal documents, such as articles of organization, and a partnership agreement or operating agreement. Is not registered under the Investment Company Act (discussed below), and also has not elected to be treated as a business development company under the Investment Company Act. Thus, venture capital managers must follow these guidelines if they wish to avoid registration with the SEC as an investment adviser. Certain venture capital managers prefer to utilize strategies that, for example, provide some liquidity to their investors, and thus may utilize the “private fund” exemption from registration under the Advisers Act, rather than the “venture capital” exemption. Under the Advisers Act, investment advisers with “assets under management” (AUM) of under $150mm are not required to fully register with the SEC. Instead, they must file only the first part of Form ADV as an exempt reporting adviser. Even if not registering with the SEC as a result of an exemption, an adviser may still be required to register as an investment adviser in the state where the adviser has its principal office and place of business. In general, most states have an exemption from state-level registration for advisers that advise fewer than five clients. A venture capital fund would be considered one client as long as the adviser provides investment advice to the fund only (not the individual members/investors of the fund). The law in this area is of significant focus for the SEC, especially as it relates to managers raising capital on behalf of funds. Federal and state securities laws require persons who are broker-dealers to register and become members of FINRA. The definition of a broker-dealer is very broad and can include managers that solicit investors to invest in a fund. As an example of the changing law in this area, on Aug. 18, 2016, the SEC approved FINRA’s Capital Acquisition Broker (CAB) rules, which state that a private fund manager that is solely engaged to advise a private fund concerning its securities offerings or other capital raising activities must now register as a CAB, which is akin to a limited broker-dealer registration. If a venture capital adviser intends to play a role that will solely be to advise a fund concerning its securities offerings or other capital raising activities, (and will not provide other managerial or advisory services), the adviser may still need to register as a CAB. Under the Investment Company Act, a venture capital fund likely does not need to register with the SEC as an investment company as long as it has fewer than 100 investors who obtained their securities in a private placement. For the purposes of calculating the number of investors under this rule, a “look through” approach is used and each member of a fund is counted toward the 99 or fewer investors allowed under the exemption. Rule 506(b) of Regulation D under the Exchange Act of 1934 allows an unlimited amount of money to be raised in private placements of a fund’s securities from an unlimited amount of accredited investors. There are several other pertinent restrictions related to this exemption, such as a prohibition on general solicitation and a cap on the number of unaccredited investors allowed in an offering. In other words, venture capital funds generally raise money in non-public securities offerings only available to high net worth individuals, pension funds, insurance companies and other sophisticated, accredited investors. “Blue Sky” notice filings are made in most states when conducting a private placement of securities. Some states have a de minimis exemption from such notice filing if only a small number (such as 15 or fewer) of potential investors are offered or sold securities. For the avoidance of doubt, this de minimis exemption is a separate requirement from the “under 5 client” rule under the Investment Advisers Act discussed above. As each state’s Blue Sky laws are different, this is a complicated area that requires close attention, and generally, the assistance of qualified legal counsel. There are a number of tax issues related with the pass-through taxation of limited partnerships and limited liability companies such as venture capital funds. Additionally, there are a number of tax provisions that exist in order to encourage investment in venture capital companies, such as the qualified small business stock (QSBS) exclusion under Section 1202 of the Internal Revenue Code. 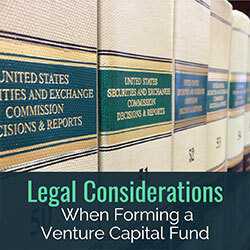 The purpose of this foregoing discussion is to help the reader in understanding the basics of the laws underlying the decision to start a venture capital fund. It is critical to consult with knowledgeable advisors before organizing a fund, including legal counsel that can help with incorporation, structuring and other fund-related issues, such as taxation and securities law. 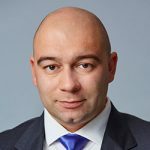 Marc J. Adesso is counsel at Waller’s Capital Markets practice group where he counsels clients in venture capital and hedge fund formation, investment management, securities, corporate finance and business transactions, including mergers and acquisitions. He provides strategic counsel relating to corporate governance, as well as SEC compliance and reporting to clients in the financial services, REIT and manufacturing industries. He may be reached at marc.adesso@wallerlaw.com or 615.850.8063.